This is a slimline tilting bracket which sits just 37mm (3.7cm) off the wall, which is much closer to the wall than most other brackets. 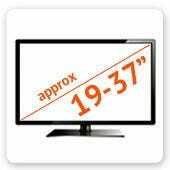 It is designed for use with the ultra slim LED screens, but is also suitable for use with LCDs and Plasmas. 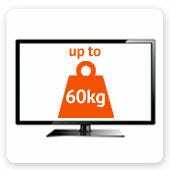 However, please note that most manufacturers recommend that LCDs and plasmas are not to be mounted within a certain distance from the wall, due to heat and ventilation concerns. 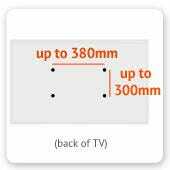 It is important that you check your TV's manual to be sure it is suitable to be mounted this close to the wall. This bracket sits just 37mm (3.7cm) from the wall, but also offers up to 12 degrees of forward tilt motion which is perfect for getting the right angle and avoiding glare from light sources such as windows. - At least 450mm wide. - No more than 380mm apart side to side.